With a pair of high-profile documentaries bringing renewed scrutiny to the sexual misconduct allegations against R. Kelly and Michael Jackson — and in Kelly’s case, renewed criminal prosecution — seemingly the whole world is reckoning with how to handle the singers’ music going forward. It’s been a messy process for streaming services, radio stations, and everyone else. A number of critics have thoughtfully weighed in, as has Pete Davidson, who opined on the matter on the latest SNL. On one hand, there are no easy answers. 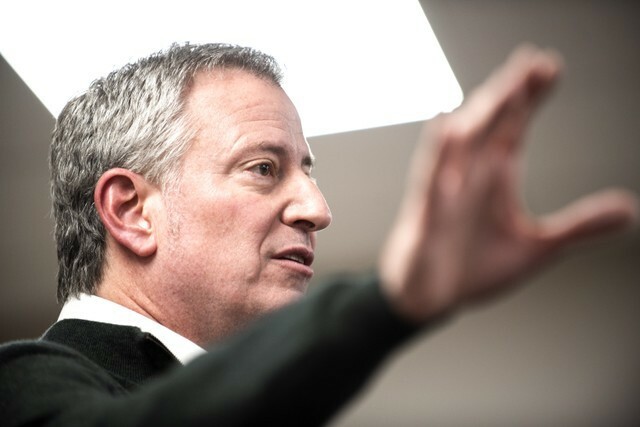 On the other hand, if you’re a politician, it seems pretty obvious that now is not the best time to be publicly flapping your arms to “I Believe I Can Fly.” So you almost have to facepalm while watching New York City Mayor Bill De Blasio do just that. As the New York Post points out, De Blasio was in South Carolina over the weekend exploring the possibility of a 2020 presidential run. He visited a church Sunday morning, where the service included a performance of Kelly’s Space Jamballad, during which the pastor encouraged congregants to flap their arms to the music. The Post points out that De Blasio has often been compared to a bird. Mayoral challenger Bo Dietl referred to him as “Big Bird” throughout his 2017 campaign, while a 2015 profile in the Atlantic compared him to “Sam the Eagle, the Muppets’ harrumphing, censorious patriot.” So maybe he really does believe he can fly.